From the earliest times of Christianity, the Holy Church has had commemorative celebrations of the Feasts of the Church, for these moments when God was made manifest leave eternal echoes that will never end, but can be entered when temporal time intersects with the Eternal Kingdom. This is exactly what occurs when the Church liturgically celebrates the events by which Christ sanctified the creation by moving on the stage of human endeavor in His Incarnation, Life, Passion, Death, and Resurrection. We say at the Paschal celebration of the Resurrection “Christ is Risen!” not Christ was risen. Since God lives always in the present tense, and is simultaneously present at all moments that will ever exist, He does not foresee the future, but is present there too as much as at this very moment. This understanding solves the difficulties encountered by Western theologians contemplating the concept of Pre-destination, for our free will is never abrogated, even though we may not always do whatever we please. Although God is present then and now, he leaves us to freely choose good or evil. Festal icons show the events in Christ’s Life and also other events at which God’s blessings were manifest in human endeavors, and give us a way to focus on these events so that we may learn from them. Some icons picture Parables of the Lord that He spoke to the people in the Gospels, or show events from the Old Testament, or other events that happened to the Apostles or Saints after He left His active work in the flesh on earth. Some depict His Miracles, some the Paschal times of His Life, and also various other subjects. Here in this section we have sorted, by such types and in chronological order, the events of Christ’s ministry and other sacred events commemorated each year in the Liturgical Cycle of Feasts and Festal celebrations. There are two general sets of festal icons painted by a single iconographer: those from Stavronikita Monastery on Mount Athos (SN 15 for the set: F01 to F15) painted by the monk Theophanes the Cretan in 1546, and those from Dionysiou Monastery, also on Mount Athos, (DM 15 for the set: F92 to F106) by George the Cretan just a year later, in 1547. There is also a striking Great Deisis set from Dionysiou Monastery painted in 1542 by Euphrosynos the Cretan with Christ in the center, flanked by the Virgin, St. John the Baptist, and SS. Peter and Paul. From the Life of Jesus are the following icons, in the order that they appear in the catalogue: the Annunciation (F01, F27, F39, F40, F132, F122, F93), the Nativity of the Lord (F02, F41, F43, F66, F139, F140), the Presentation in the Temple (F03, F125, F94) Christ in the Temple at 12 and Mid-Pentecost (F69, F126), Holy Theophany (F04, F148, F95), the Transfiguration (F05, F48, F65, F84, F141, F96), the Wedding at Cana (F73, F113), Jesus Calling the Disciples (F44), the Raising of Lazarus (F06, F49, F61, F97) and the Entry of the Lord into Jerusalem (F07, F77, F98). From the Paschal series, we have also in the same order that they appear in the catalogue: Christ in Gethsemane (F45, F47, F18, F21), the Mystical Supper (F82, F23, F30, F146), Washing the Disciples’ Feet (F19, F62), His journey to Golgotha (F114, F150, F115, F116, F133, F110), the Crucifixion (F08, F67, F51, F50, F28, F29, F128, F20, F137, F149, F99), His entombment (F63, F54, F120, F110, F100), His Resurrection (F09, F53, F25, F64, F80, F86, F85, F123, F138, F101), those from the empty tomb (F10, F11, F12, F117, F36, F59, F22, F102), and the Ascension (F13, F81, F103). Besides these different events in the festal commemorations, there are other ways to look at the variations among the many icons in each section of this catalogue, whether they be of the Lord, the Virgin, Feasts, Prophets, or Saints. Iconographers often did not sign their work before Renaissance times, so we know little of who painted which particular icons before then. Many iconographers do not sign their work even today, only giving God the glory. There is, however, a wide selection of famous iconographers whose works are included here such as St. Luke the Evangelist, St. Alypy of the Kiev Caves, Manuel Panselinos, Theophanes the Greek, St. Andrei Rublev, Michael Damaskinos, Euphrosynos the Cretan, George the Cretan, Theophanes the Cretan, Emmanuel Lambardos, Andreas Ricco, Emmanuel Tzanes, Andreas Ritzos, Simon Ushakov, Fiodor Zubov, and Master Pavel Ochinnokov. As cultures of the pagan world were baptized into the Church at various times, local iconographic traditions grew up in local churches of these local cultures. Our selection includes icons of various heritages representing these local churches, such as: Byzantine (over 75 examples), Bulgarian (over 10), Cretan (over 75), Greek (over 500), Macedonian (over 20), Roumanian (over 10), Russian (over 200), and Serbian (over 30). 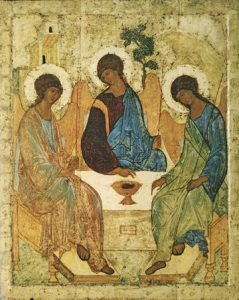 Some of the schools that are also identified in these icons are those of: Andrei Rublev, Armory, Kiev, Macedonian, Moscow, Novgorod, Palekh, Paleologian, Rostov/Suzdal, Stroganov, Tver, Vladimir/Suzdal, Vologda, and Yaroslavl. Our icons represent the full range of ages that iconography has been practiced and which has given us so many treasures of visual delight. We carry at least six icons from the 1st century A.D., 20 from the 4th to 10th centuries, 100 from the 11th to 14th centuries, 200 from the 15th and 16th centuries, 70 from the 17th to 19th centuries, and 440 from the 20th century. We now have a very extensive collection of icons with over 1125 represented here, including over 825 regular stock icons in inventory in many sizes from 3” x 4” to 2’ x 3’. An additional 300 subjects are shown here for the first time in our custom selection, that is made to order in any size you wish, limited only by the size to which they can be enlarged without distortion. Our Feast and Festal selection that follows immediately shows many other icons not specifically mentioned here, so browse through and see the vivid revelation of the iconographic view of Heaven and the Future Age.